DAV International was recently honoured with the prestigious CBSE Sports Promotion Award-2013. The Principal of the school Ms. Anjana Gupta was presented this award on 4th September, 2014 at Manakshaw Centre where a grand function had been organized. 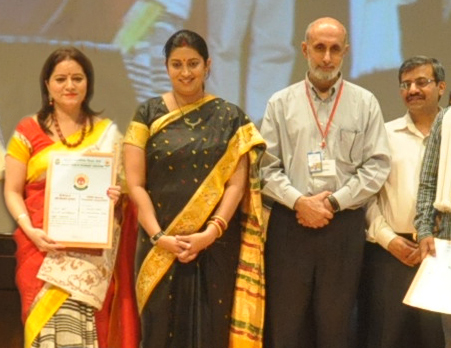 The award was presented by the Human and Resource Development Minister Mrs. Smriti Irani, Secretary of Education Ministry, Sh. R. Bhattacharya and CBSE Chairman – Sh. Vineet Joshi. The school has been organizing various CBSE tournaments at Zonal, State and National Levels for the past many years. The school hosted Natioal Level Chess Competition in 2009, National Level Skating Championship in 2012, Zonal level Chess Championship in 2005 & 2008 and Zonal level Tennis Championship in 2013. While organizing all these prestigious tournaments the management, Principal, staff and students of the school extended full co-operation. The participating schools were provided with the best of everything. Hence, the school has made valuable contributions in the promotion of sports. This year in September, the school is going to host yet another tournament i.e. CBSE Zonal Level Tennis Championship. On the occasion of winning this coveted award the Principal of the school Ms. Anjana Gupta was congratulated by the President Sh. Punam Suri Ji, Director Public Schools – I Sh. J.P. Shoor Ji, Chairman of the school – Dr. V.P. Lakhanpal Ji, Regional Director – Dr. (Mrs.) Neelam Kamra Ji, Manager of the school – Dr. K.N.Kaul ji, the school staff, students and their parents.